The transition between the virtual world and the real one is strangely fluid. Since I left Alaska, I've had the opportunity to meet several people that before I only knew - or knew of - online. It's strange to look into the eyes of someone you've only seen pictures of, hear the voice of someone you've only seen text about, and really feel like you know them. I find myself listening to their stories and saying, "Yeah! I remember that!" Of course I don't remember that. I remember the blog post they wrote about that. The line between virtual and real is often more blurry than we're willing to admit, and I'm one of those people that's OK with that. 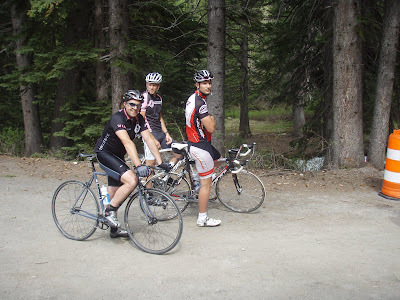 Today I met up with Elden and his friends for a road bike ride up the Alpine Loop. Since I don't have a road bike, Elden was nice enough to lend me one of his. He even gave me his geared Ibis road bike and rode his singlespeed so I'd feel more comfortable. But road bikes are still fidgety creatures. I feel weird balancing on 23mm of rubber and leaning over drop bars and only using two fingers to pump the brakes (I generally use more of a white-knuckle-full-fist braking approach.) All of Elden's friends turned out to be these buff-looking guys. 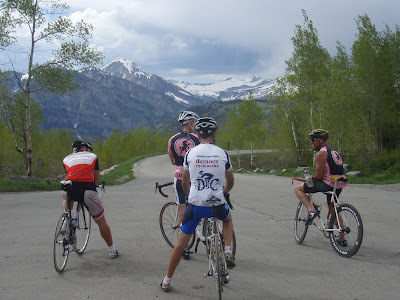 I was the only female in the group, the only one on a borrowed bike and the only one who still feels severely oxygen-deprived above 7,000 feet. I braced myself for disaster. Oddly, disaster did fall, but not on me. About three miles into the ride, Kenny - a guy I know from Elden's blog as "the singlespeeder who crushes every race he enters and rode the whole Kokopelli Trail in an unreal 14 or 15 hours" - hit a freak patch of gravel, swerved wildly in a dust cloud and toppled next to a large rock just as Elden and one other guy flew over him in a tornado of bikes and bodies. I was fourth in line and - as uncomfortable as I am with pace lines - hanging far enough back that I was able to slam on my brakes and stop just short of the wreckage. It was the most stunning crash I have ever witnessed - similar to those Euro-roadie pileups that I've seen on YouTube - but luckily everyone hit the tarmac laughing. It took a while for them to untangle themselves, and Kenny had a deep gash over his eyebrow and road rash on his shoulder and knees. It looked painful. I would have turned around on much, much less, but Kenny just washed his face in a waterfall and kept going. I rode most of the climb with Kenny. Probably because of a combination of soreness from the spectacular crash and the unreal gear he was running - I think he said it was a 50x17; Elden analyzed us and said I made two and a half rotations for every one of Kenny's - I was able to keep up with him. We talked about Kokopelli and photo processing. We talked about a funny picture Elden photoshopped of me towering over Kenny (one of the ongoing reactions I have heard after meeting virtual friends for the first time is that I am bigger in person than they pictured me. It's funny to me, because I don't view myself as a big person. Maybe it's because I'm usually wearing six layers of clothing in my self portraits. I'm 5'7" for the record. But notice Kenny ducking in the top photo? That's intentional.) But it was a fun ride up. I felt like I was catching up with an old acquaintance. First time I ever met the guy. Looks like you're having fun Jill. Yay! I'm so glad Fatty made the virtual introduction; your blog is almost as awesome as Kenny's SS. Much enjoyed your cogent ramblings. P.S. my word verification was borderline pornographic. All the better! 5'7" is impressive to those of us who are 5'meh. I love my road bike more than my mtn bike, so we are very different, but your blog gives me courage to keep trying. Love the pics - I wish I took more pics - but so far have just managed some of the shed - so must get camera outside - yes it is a weird virtual world...but I love it! Looks like it was fun with the group on the road. Is it any less of a suffer fest when you have someone riding with you? I have friends who are great riders but who get all weepy and take days off for a scatched finger nail. You look great wearing that smile, keep it up! Jill- It was great to meet you and ride together. And I'm glad you avoided our group hug (crash). looks like you're having a blast down in the lower 48. I must say you have missed a glorious May here in Juneau! See ya soon?! Jill - Nice to ride meet and ride together. Good luck with the cross country race. Love seeing pics of you with the guys. I follow Fatty and Dug and Kanyon Kris so I'd have a similar sense of deja vu if I'd been on that ride with you guys!